Previously my assumption about the width auto works as if its contents are but now with a little knowledge no it works as if its block full width. So I'm confused here with the width 100% and the width auto. Can anyone please describe me about differences between these with explanation? The initial width of a block level element like div or p is auto. This makes it expand to occupy all available horizontal space within its containing block. If it has any horizontal padding or border, the widths of those do not add to the total width of the element. On the other hand, if you specify width:100%, the element’s total width will be 100% of its containing block plus any horizontal margin, padding and border (unless you’ve used box-sizing:border-box, in which case only margins are added to the 100% to change how its total width is calculated). This may be what you want, but most likely it isn’t. width: auto; will try as hard as possible to keep an element the same width as its parent container when additional space is added from margins, padding, or borders. width: 100%; will make the element as wide as the parent container. Extra spacing will be added to the element's size without regards to the parent. This typically causes problems. It's about margins and border. If you use width: auto, then add border, your div won't become bigger than its container. On the other hand, if you use width: 100% and some border, the element's width will be 100% + border or margin. For more info see this. As long as the value of width is auto, the element can have horizontal margin, padding and border without becoming wider than its container (unless of course the sum of margin-left + border-left-width + padding-left + padding-right + border-right-width + margin-right is larger than the container). The width of its content box will be whatever is left when the margin, padding and border have been subtracted from the container’s width. The initial width of a block level element like div or p is auto. Use width:auto to undo explicitly specified widths. if you specify width:100%, the element’s total width will be 100% of its containing block plus any horizontal margin, padding and border. So, next time you find yourself setting the width of a block level element to 100% to make it occupy all available width, consider if what you really want is setting it to auto. Using width:auto; + display:inline-block; in css giving awesome effect. Width 100% : It will make content with 100%. 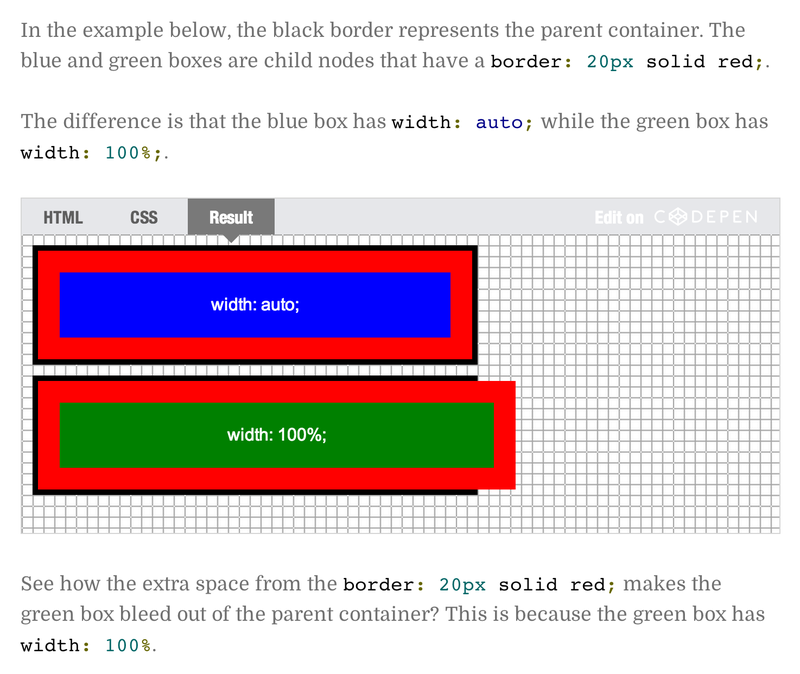 margin, border, padding will be added to this width and element will overflow if any of these added. Width auto : It will fit the element in available space including margin, border and padding. 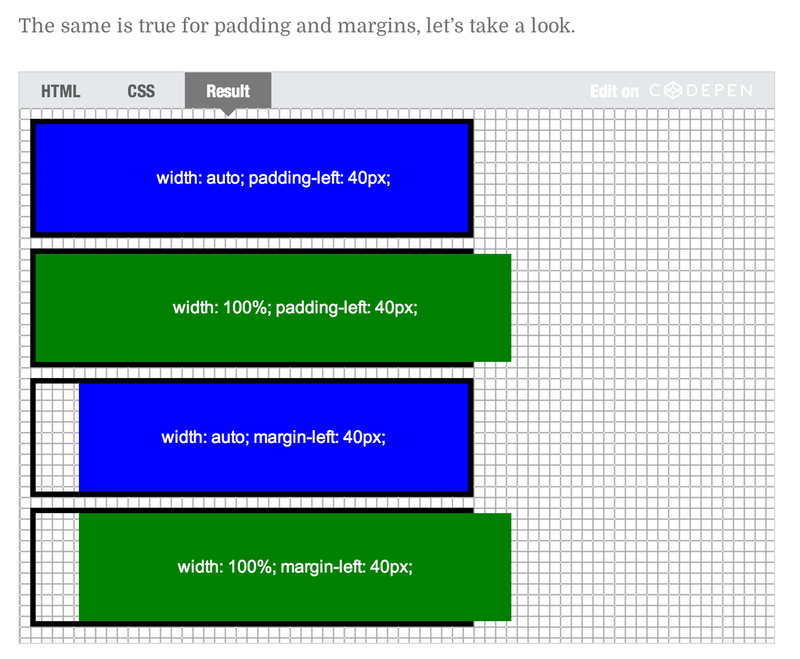 space remaining after adjusting margin + padding + border will be available width/ height. Width 100% + box-sizing: border box : It will also fits the element in available space including border, padding (margin will make it overflow the container). Why is the size of a nested row with multiple columns inside col-auto more than content width? How to specify wdith of inner divs as percentage?